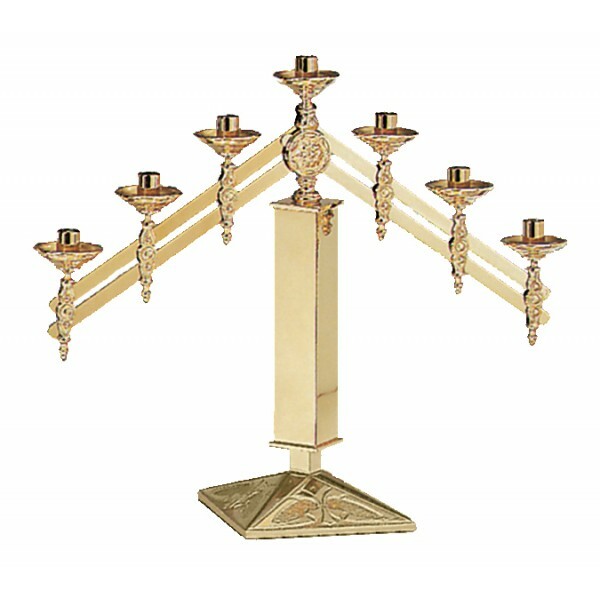 Excelsis 200 Series Altar Candelabra with adjustable arms, available as 3, 5, or 7 light piece. Metals available are bronze or brass. Finishes available are high polish or satin. Also available with wood shaft (Light, medium or Dark Oak). Call for details. The 3 light candelabra is supplied with 1.5" x 1.5" sockets & wax protectors, and the 5 & 7 light candelabras are supplied with 7/8" x 1.5" sockets & wax protectors. Image displays 7 lite, high polish, bronze model. Many matching items are available in the 200 series.